Coconino County in relationship to other Arizona state counties. Sedona AZ (November 26, 2018) – On November 6, 2018, Coconino County’s voters adopted merit selection to replace the direct election of superior court judges. Going forward, candidates for superior court judge vacancies will apply to a sixteen-person commission, which will nominate qualified candidates based on their merit and submit their names to the governor for appointment to the bench. This process has been used since 1975 for Arizona’s appellate judges, including the Supreme Court, and is also now used to select superior court judges in Maricopa, Pima, and Pinal Counties. Arizona’s merit selection system is part of Arizona’s state constitution. Each county that participates in merit selection has its own nonpartisan commission that reviews applications, takes public input on candidates, and interviews candidates for judicial openings. After the public interview process, the commission submits the names of at least three highly qualified applicants to the Governor for selection for each opening. 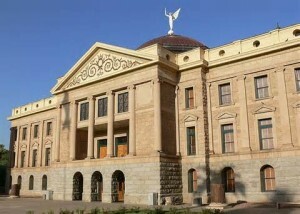 Each commission includes the chief justice or another justice (who generally do not vote) and fifteen members of the public who are appointed by the Governor and confirmed by the Arizona Senate. Judicial nominating commissions have ten non-lawyers and five attorney members. Once a judge is appointed under the merit selection process, a separate Arizona Commission on Judicial Performance Review (JPR) reviews whether the judge meets judicial performance standards and provides the results to voters. The JPR Commission includes attorneys, judges, and public members. Superior Court judges appointed under the merit selection system appear on their county’s election ballot for the first time two years after their initial appointment and then every four years. Voters receive the JPR Commission’s ratings in their voter publicity pamphlets before the general election. The county’s voters decide whether to retain the judge in office for another four years. For more information on the Judicial Nominating Commission, the Arizona Commission on Judicial Performance Review, and other committees, commissions, councils, and boards, see the Arizona Judicial Branch’s website at https://www.azcourts.gov/committeescommissions. For more information about Arizona’s judicial branch, visit www.azcourts.gov.